"This is Man's ultimate humanoid fighting machine, the first model of the synthetic life form Evangelion, Unit 01." 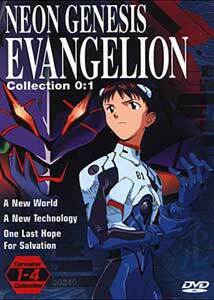 One of the most popular anime series ever, Neon Genesis Evangelion ( Shin seiki evangelion commonly referred to as EVA) centers around a 14 year old boy, Shinji Ikari, who reluctantly becomes the operator of the Evangelion 01, a huge robot designed to fight the equally impressive enemy of Angels who are attacking Tokyo 3. Shinji's father, Gindo Ikari, who he has been disassociated with for years, is the most powerful man on earth and designer of the Evangelion project. This is a great series which features just about everything an anime fan could ask for: a complex story, rich character development, a bit of fan service and lots of mecha action. There is drama, comedy and a wealth of excellent animation. My only disappointment was that the disc was over so soon! This disc features the first four episodes of the 26 part television series. For purists, the presence of English overlays (especially "Toothpicks" and one glaring sign replacement) will be unwelcome, but most are not that obtrusive, even though they do alter the original video, which should be highly frowned upon. However, despite my purist intentions, I almost welcomed them over having even more subtitles on the screen while watching anything but the English language version, though I would have prefered the option of an alternate angle track to have both the unedited and overlayed versions available. The opening song (which I really enjoyed) features English subtitles for episode 1 and 3, and Romanji for episodes 2 and 4. Although only the English language credits follow each episode (along with a teaser for the following episode - note the translation for "something special" on the english audio track), full credits for each language version are included at the end of the disc. Image Transfer Review: For the most part the image is excellent, with only a few areas where shimmering are evident. There are a few color shifts in the transfer, which will only be noticed if one is really paying attention. Aside from some unwelcomed overlays, this disc looks great. The English subtitle track does not match the dub track at all. The only part that really has aliasing problems in the credit rolls which follow each segment. Audio Transfer Review: We are offered four stereo audio tracks: Japanese, Spanish, French and English. Although there are obviously differences in the voice actors, overall the tracks seem pretty consistent in quality. It is fun to watch these episodes in each of the languages to hear how the different characters sound. Extras Review: Aside from very brief (and thankfully non-spoiler) character bios, we get 12 previews for other ADV DVD releases: Tekkon, Battle Angel, Neon Evangelion 01, Bubblegum Crisis: Tokyo 2040, Sonic The Hedgehog, Slayers, Queen Esmeraldas, Legend Of Crystania, Sakura Wars, Burn Up W, Ruin Explorers and Ninja Ressurection. DVD production credits, and a link to ADV's website are also included. The menus are nice and feature background music and animation, but are hardly "highly interactive" as the plug on the case suggests. While I could live without the four forced logo trailers that open the disc, overall I really enjoyed this one. I have mixed feelings about the issue of overlays. ADV has stated that they will no longer use overlays on their future releases. While I do feel that the original video must be available fully intact, if the overlays are done well, as they are in most cases on this disc, having them available as an alternate angle, rather than subtitles, might be a good idea. I'd also prefer more than 4 chapter stops per episode. My only other complaint is that buying any of these multi-part series when only one issue is available is frustrating, as I really wanted to continue watching the show! Still, four episodes on the disc is great, the quality is very good throughout, and the four language tracks will be a bonus for North American audiences. Neon Genesis Evangelion 01 comes highly recommended, though due to the violence and some adult subject matter, parents should use their discretion. I can't wait for more!